Rulanyil's Fall is an Ayleid ruin located in the Greenshade region of Valenwood, northeast of Woodhearth. It is one of the most impressive examples of Ayleid architecture in all of Valenwood, and possesses its own Ayleid Well. When the White-Gold Tower fell to Nedic rebels in 1E 243 after the Alessian Slave Rebellion, the Daedra-worshipping Rulanyil clan was forced to migrate out of Cyrodiil to avoid slaughter. They abandoned the city of Vilverin on the shores of Lake Rumare and traveled to Greenshade to found Rulanyil's Fall. Although they escaped largely unscathed, the clan's fervor for Daedra worship decreased, and they were forced to abide by the Green Pact in order to continue receiving aid from their Bosmer cousins. 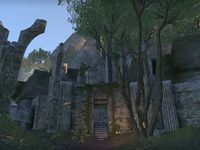 Within two thousand years of its founding, Rulanyil's Fall was left abandoned, its Ayleid inhabitants having been integrated fully into Bosmer society. By the time of the Interregnum, the ruins of Rulanyil's Fall were occupied by the Merethic Society, a loose group of adventurers devoted to hoarding antiques. It was repurposed as "Endarwe's Museum of Wonder and Antiquities", where the society displayed their various historical relics to the general public. Among their more notable possessions were the warhorn of High King Borgas, the sword of Aiden Direnni, the crown of Mansel Sesnit, a compass from the All-Flags Navy, as well as various Altmeri and Nedic antiques. However, the centerpiece of the collection was the corpse of Warlord Ceyran, a fearsome Ayleid leader and Daedraphile who had been entombed in Rulanyil's Fall. However, in truth the body was that of an Altmer named Nanwen, a member of the Merethic Society who had died in a cave-in while repurposing the ruins. In 2E 582, the Worm Cult invaded the ruins in order to resurrect Ceyran as a powerful undead servant. The cultists destroyed many of the exhibits, raising the dead to fortify the ruins while they prepared the ritual. Fearing that his secret would be discovered, Endarwe sent groups of adventurers into the ruins to fight back against the cultists, rescue the surviving relics, and prevent Nanwen from being resurrected. Many of the items were retrieved, and the Worm Cult only succeeded in binding Nanwen's awakened spirit to a sword, which Endarwe agreed to part with in order to continue displaying the corpse as Ceyran. Among the cultists killed in the ruins was Magna Tharn, a member of House Tharn. A resurrected Ayleid named Hergon the Fallen was also banished when he attempted to raise his own army of undead. For game-specific information, see the ESO articles.